While the best economic development strategies prepare communities for prosperity well into the next generation, their results get measured today. 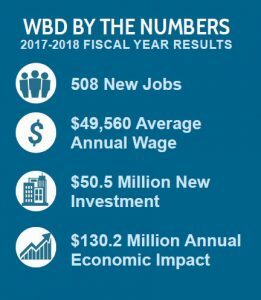 Sound planning and effective execution made 2017-2018 a banner year for WBD and Greater Wilmington’s economy. 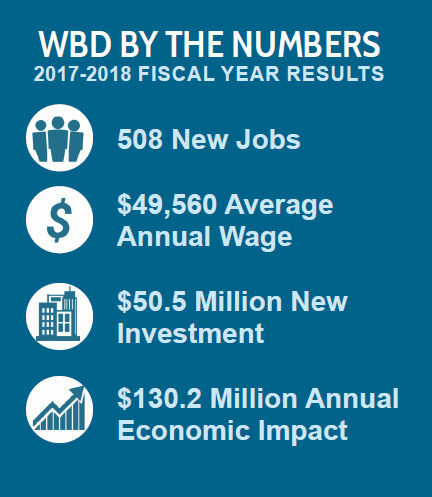 WBD’s project portfolio spurred the creation of 508 new jobs in New Hanover and Pender counties at annual wages averaging $49,560. 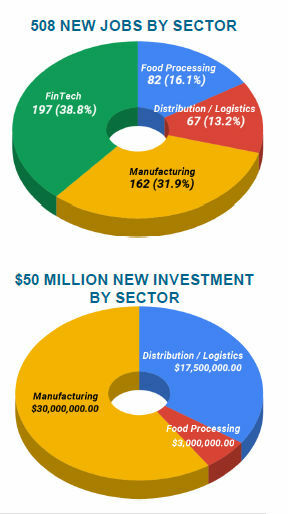 These projects are generating $50.5 million in capital investment, adding significantly to the region’s industrial tax-base. The organization’s work helped generate an additional $25 million in regional payroll impact. Cardinal Foods – A consumer foods company specializing in frozen fruits & vegetables chose Burgaw for their new facility. Coastal Beverage Company – One of eastern North Carolina’s premiere distributors of beer, wine, and non-alcoholic beverages, has selected Pender Commerce Park as its new home for regional distribution space as well as its corporate headquarters. FedEx Freight – The Less-Than-Truckload unit of the global logistics giant selected a Pender Commerce Park for a new service center. National Gypsum Company – The Charlotte-based Corporation who manufactures wallboard will re-open its Wilmington production facility. Edge Works Manufacturing – Maker of G-Code Holsters and accessories, will fill the vacant building in Burgaw once owned by Chloride Systems. Acme Smoked Fish – Acme’s state-of-the-art food processing plant opened in 2014. In the past year, the company added positions to its workforce. Bluearrow Warehousing & Logistics – A New Jersey based operation will occupy 100,000-sq.-ft. of space at the Cape Fear Industrial Complex in Rocky Point.